Many of my bruises occur because of dropping things on my feet and last week I opened the freezer to have half a frozen chicken fall on my toe. I literally still have a purple toe, eight days later. However, I have been taking steps in the last year to declutter, organize, and basically simplify life. I thought over the next few months I would share some of these things I have done to try to make life more organized–which means I spend less time looking for things, cleaning things, putting things away and so much more. So here are 7 of my kitchen ideas to keep those toes safe! 1. If you are not a fan of digging under the sink for your bottles of cleaner, whether it is store-bought or organic, a simple tension curtain rod under the sink is a great way to keep everything within easy reach. I found this idea on Pinterest and it has worked well, including not having to clean up the Ajax that used to fall out on the floor half the time as I dug through the cleaners. This is what it looks like under my kitchen sink. And yeah, I know I don’t need all those cleaners. An updated photo would show my little spray bottles of vinegar, water, and baking soda. I am trying! 2. 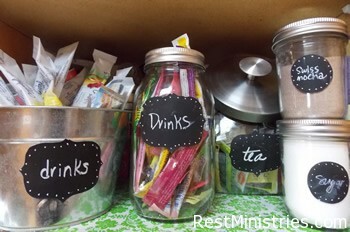 Plastic containers are another one of those items that can take over a cupboard. I love these freebie containers that come with food items, but the lids used to drive me crazy. This handy idea from Pinterest is just a CD holder. I found one at the local thrift store for $.50. 4. I love having tons of flavors of drink mixes on hand, but the one I wanted was always in the box on the bottom (how does that happen?) 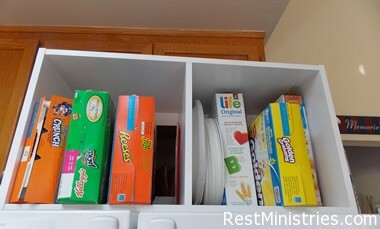 I really wanted to learn how to organize my cupboard better because I can’t reach above the bottom shelf with my rotator cuffs having pieces missing. Now, I open up this little cupboard and seeing the little mason jars and such just makes me happy. I know–I am weird. (But first, I can see what I have or am running low on and secondly, the lids are easy to get off, but still keep everything fresh. 5. I always had packets of gravy mix or meatloaf mixes falling all over. I stuck some contact paper on a plastic container and now they are all in one place! And a wire rack holds our popcorn packets. 6. 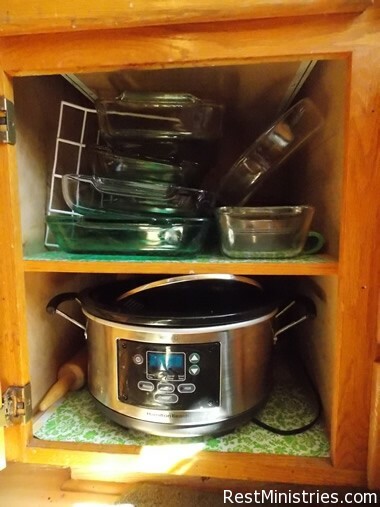 I have tried to figure out how to organize plates better and my “plate cupboards” are so narrow, a typical dinner plate is too deep to fit inside, so they end up in a lower cupboard. Ah well, I guess plates in the seventies, when the cupboards were built, really were smaller, huh? I always want one on the bottom and my fingers can’t lift very many and half the time we would end up just using paper plates (I know, sad, huh?) 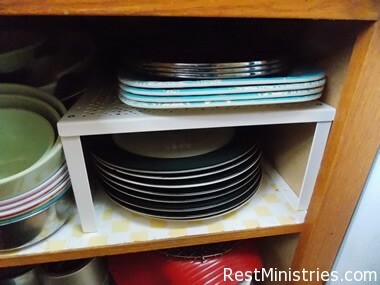 I found these simple but very sturdy plate holders at IKEA for about $7 and they have helped me keep dishes much more organized. I also use them in my office and son’s room as it is a better way to stack without stacking boxes on top of one another which requires more lifting. 7. One of my biggest deterrents to cooking has always been getting a baking dish out. I have always wanted those drawers that pull out that hold all your bake ware but it was the expense I didn’t want. 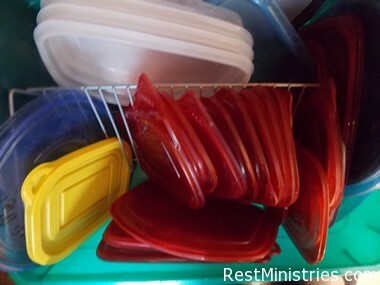 So, trying to figure out how to organize my casseroles dishes, I found these, Mainstays Organizer Racks, at Walmart for under $6.00. Turn it sideways and now you can get out just one piece of bake ware without having to pull them all out while they are nested, which was always too heavy for me. This photo isn’t great. Afterwards, I got my dad to connect it to the wall when he was visiting. I think he is as excited about my Pinterest inspiration as my husband (smile). 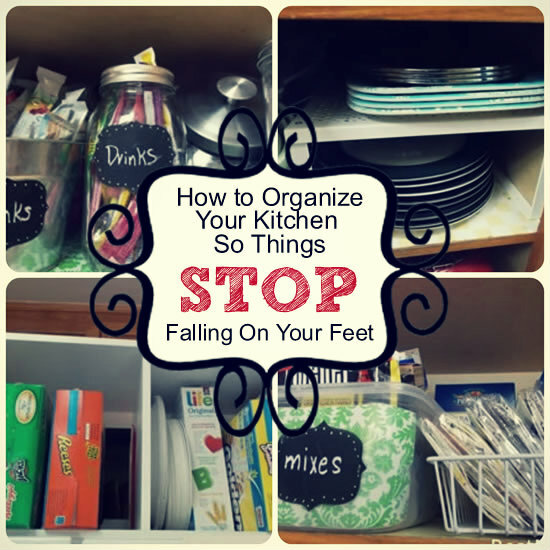 Do you have any favorite tips on how to organize to prevent things from falling on you? Post them below so we can borrow your ideas and all our lives can be easier. . . and we’ll have fewer bruises and swollen toes! Stay tuned for the next post when I give you a peek inside my refrigerator (is that brave or what?) and a post where I share my favorite gadgets in the kitchen. And don’t forget! 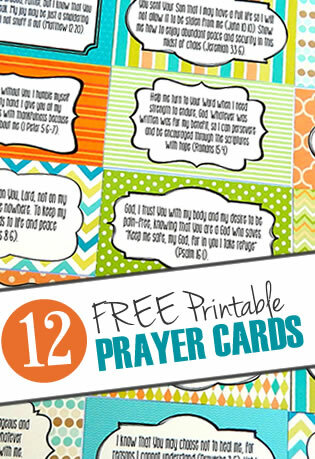 If you are on Pinterest, Pin This! (see button above at the beginning) And if you aren’t, be sure to follow Rest Ministries on Pinterest for loads of good ideas to make life easier when you live with a chronic illness. Lisa, what cool ideas!! You deserve kudos for actually doing the organizing!! Some of your comments gave me a chuckle. I use long tongs to reach some things on shelves too high for me to reach. I also have several Rubbermaid turn tables, etc. for canned goods and smaller items for the fridge. I also have a larger one for the table, to keep a small kleenex box, salt and pepper, sweetener, etc. on. As one who is grateful that her son is eating Cheerios for breakfast (because it means that (1) he is eating and (2) he is eating something for breakfast), you will never hear me complain about what someone else’s kids do or don’t eat. Kudos for finding something he WILL eat. It’s a long road. Thanks Lisa! Some great ideas here, thanks for sharing them. I used to LOVE going into shops with storage ideas before I became ill. Simplifying storage just feels fun to me. Used to love things like that for my teaching too. 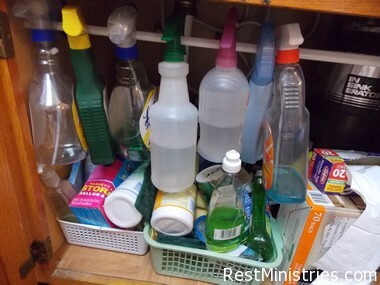 The one BIG blessing of developing multiple chemical sensitivities (MCS) is that I’ve thrown out 95% of my cleaning chemicals leaving LOTS of space & order now! LOL! It’s amazing that a very few things do everything now…..cheaper too. 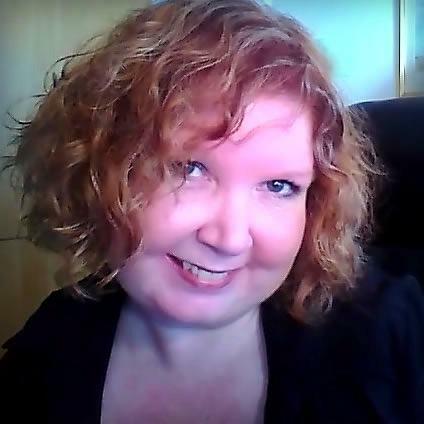 Thank you, Lisa for sharing all of these great tips! One of the good ideas I have gotten over the years to help me declutter a lot of the “kitchen paper” is to put cork board on the inside of some of my kitchen cupboards. Here I can designate places for special diets for each member of the family, calendars, notes about which prescriptions need refills, etc. One of the other things that has helped me so much with dropping things in the kitchen is getting proper splints and braces for my hands, fingers and wrists. I have recently been fitted with 15 silver ring splints for most of my finger joints since I have hypermobility in them and am always dropping things because of it. For people with arthritis and other hand and wrist problems, seeing an occupational therapist and being fitted with proper braces and getting other hints about things to help around the kitchen are so helpful! 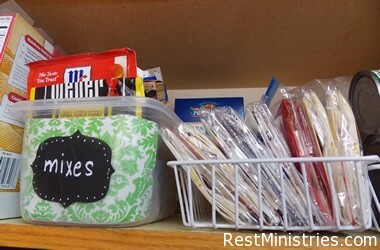 I know this devotional is about decluttering the kitchen, not about dropping things, but when you drop things a lot, it also makes for a lot of messes in the kitchen (just ask me!!) and makes it hard to keep things tidy in there. I am still dropping things in the kitchen, but it has gotten a lot better these days thanks to my new silver ring splints. I get a lot of comments on how pretty they look too! They look a lot and fit a lot better than the plastic ones I used to wear, and since they are metal my private insurance is supposed to be covering them too, PTL! Thanks, Bonnie. I am familiar with the silver ring splints they just didn’t work for me. I had 4 joints in my hands replaced in 2009 and one finger pops up really high so they had me try to hold it down with the splint but just too much pressure/pain. yes, my therapist told me a few this to buy like an electric jar opener. Our kitchens may look odd to others but they work for us, huh?